Bryan Ferguson, who is a AAA member of the Professional Golfers Association and master club fitter, has been a “specialist coach” for 40 years and believes that a holistic approach is the best way for golfers of all levels to improve their game. 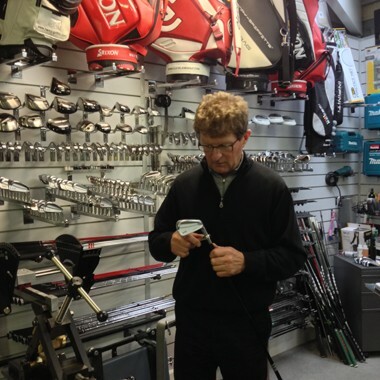 Bryan has attended, organized and conducted many club fitting seminars for professionals and associations. He is responsible for training over 200 golf professionals in the art of club fitting and coaching through his work and ongoing search for the connection between golf swing, body type and ball flight analysis. “I have always been a great believer that equipment affects motion and it is this belief that has brought much awareness to many golfers I see on the lesson tee that a balanced swing should produce consistent results. If it doesn’t, let’s find out what part of the golf club equation is getting in the way.” Bryan Ferguson. Bryan was honored as one of the World’s Top 100 ClubFitters for the past five years (2014-2018). Bryan is also a member of the International Professional Association of Clubfitters (IPAC), the prestigious association of the finest clubfitters around the globe. They have dedicated themselves to raising the bar for the profession, who strive for the highest standards of skill and integrity, and who help educate the public on where to go and what to expect in a real fitting. Once the clubs have been fitted correctly by a competent teacher, a freewheeling swing can be taught instead of compensations related to ill fitting clubs. This often means more distance, less strain on the body and a consistency never experienced before. Bryan has several fitting systems. Two of the best ball flight monitors available, (FlightScope and Trackman), high speed cameras and biomechanics analysis (K-Vest , 3D Trainer). He has also studied many different coaching methods of which he uses to fit different golfer’s needs and body types. At his coaching venues there are also a wide variety of training aids and equipment to have the golfer instantly feel movements and patterns that help them swing the club the way that best suits. Bryan has coached and fitted clubs at many of the top coaching venues in Victoria, such as Melbourne Golf Academy and Albert Park Driving Range, as well as Marina Bay Driving Range in Singapore. He has fitted golfers of all levels from beginners to touring professionals. He loves seeing improvement and enjoys immensely the happiness a golfer “gets” when they see themselves improving to higher levels and experiencing more enjoyment of the game. Give Bryan a call or send an email to set up an appointment. He will be more than happy to discuss the process of custom fitting and how he can help your game.